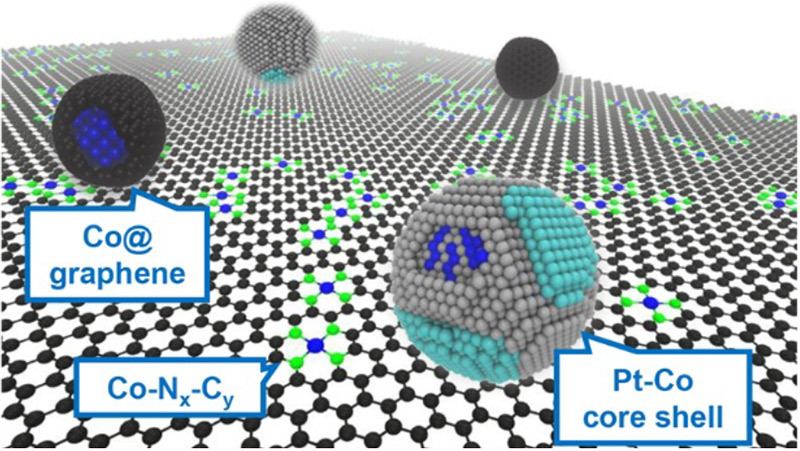 Schematic of the synergistic catalyst showing the three types of active sites: Pt-Co nanoparticles, Co@graphene, and Co-N4-C, on a platinum group metal-free support. A synergistic, platinum-cobalt (Pt-Co) catalyst with high catalytic activity and durability at ultralow Pt loading was created for fuel cell applications; modeling confirmed Pt-Co interactions with the precious metal-free support play a significant role in the performance improvements. The synergistic catalysts reached mass activities of 1.08-1.77 A mgPt-1 which exceed the 2025 U.S. DOE target of 0.44 A mgPt-1 for fuel cells. Design, synthesis and testing were performed in Argonne’s CSE Division; XAFS/XANES were performed at the APS. Characterization at the CNM included aberration-corrected high-resolution transmission electron microscopy (HRTEM) with EDS and EELS; first-principles DFT modeling was performed on the CNM Carbon computing cluster. Work was performed in part at the Center for Nanoscale Materials and Advanced Photon Source. Di-Jia Liu is Chemist and Principal Investigator in the Catalysis and Energy Conversion group of the Chemical Sciences and Engineering Division.